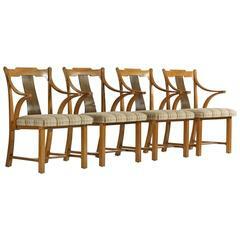 Edward Wormley Janus Collection for Dunbar. Solid oak frames with stainless steel stretchers that connect the legs. 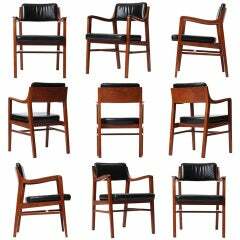 The chair have their original finish and have been reupholstered in spinneybeck leather. Four pairs available. 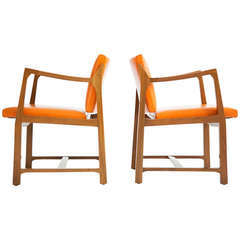 Wormley for Dunbar, pair of rare model 4869 open armchairs. Sapwood walnut, with tilting back. Reupholstered, smooth pumpkin color leather by Spinneybeck. 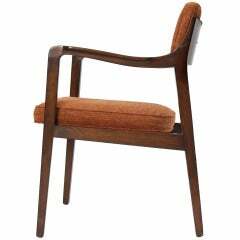 A sculptural and finely detailed armchair in walnut having a floating seat and back cushions that retain their original textured wool upholstery. 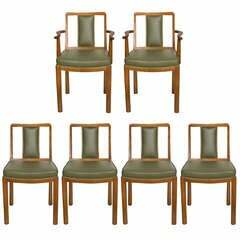 A pair (2) of continuous arm swivel chairs in laminated walnut having tan button tufted leather cushions and a cruciform stretcher detail. 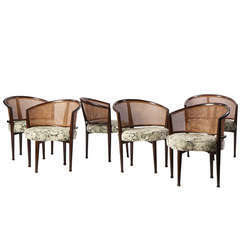 An elegant and unusual set of six dining chairs with a cane wrapped barrel back and an upholstered seat atop four slender legs. A sculptural and finely detailed armchair in teak having a floating seat and back cushions, retaining the original black leather upholstery.